Stefan lives in a terraced property in St. Margaret’s, and has no driveway or garage where a home charger can be installed. Stefan drives a plug-in hybrid Volvo which uses electric power and a petrol/diesel motor to run the car. “My friend used to race electric vehicles and I started building one of my own, but I changed companies and didn’t have the facilities to carry on, but a lot of people were really doing their own thing and making their own electric vehicles. 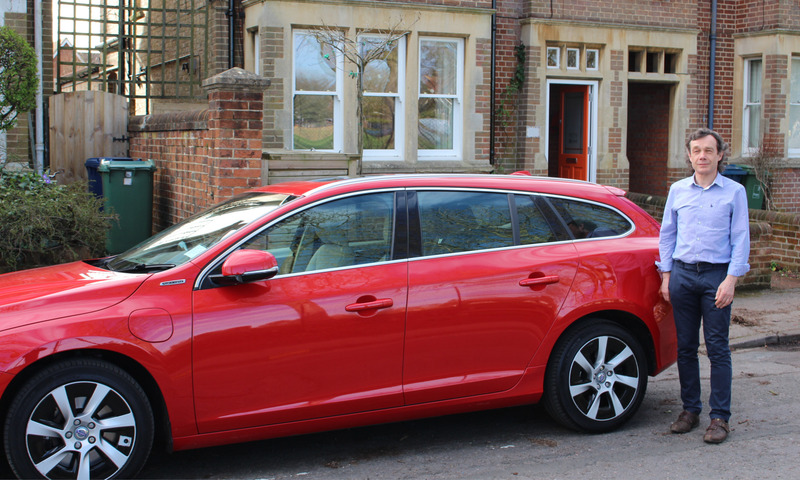 Because of the long journeys Stefan makes regularly, and the lack of options for charging at home, Stefan opted for a plug-in hybrid which uses electric power and a petrol/diesel motor to run the car. “If you’re in town you can drive very cleanly, the other advantage is that if you charge it frequently enough your miles per gallon is much better than your average vehicle. How will having a charging point close to home help? “If you can charge the car at home, you have complete access to all the benefits the car has to offer. If we go to visit family in Oxfordshire we would be able to do the trip on electric. We can charge while we are there and come back on pure electric – so that’s two journeys that would have been diesel, which are now on electric. Anything that we want to do around town – say, go to Woodstock and back we would use electric.